After years of double-digit growth, China’s automobile market is slowing. According to a new study by McKinsey, the world’s largest auto market will grow only 5 percent annually until 2020. The weak economy hurts auto sales. 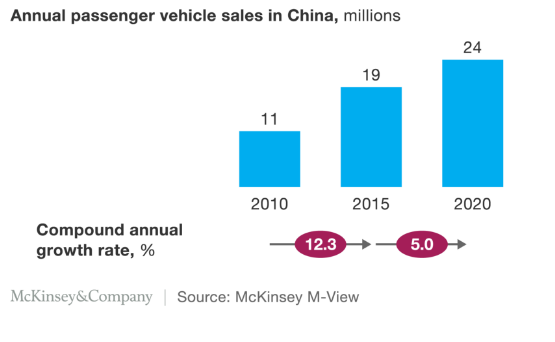 In addition, a change in consumer behavior is affecting the automotive sales in China. “Changing consumer attitudes and macroeconomic headwinds are slowing growth in China’s vehicle market. 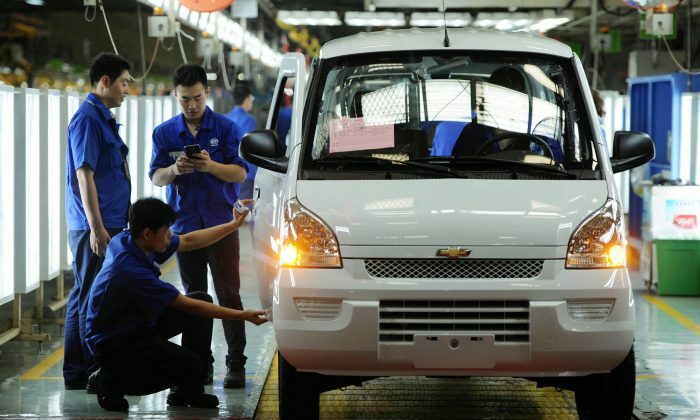 From 2010 to 2015, vehicle sales in China increased by more than 12 percent a year. Looking out to 2020, however, we project that the vehicle market will grow by an average of 5 percent a year,” stated the McKinsey report. Car prices in China have fallen 4 percent each year over the past decade due to intense competition among automakers. But despite the widespread price cuts, monthly new car sales fell sharply in the first three quarters of 2015 as the economy slowed. However, carmakers benefited by a tax reduction on vehicle purchases from October 2015, which will last until the end of 2016. The Chinese government cut the purchase tax on vehicles with engines of 1.6 liters or smaller to 5 percent in an effort to boost car sales. With the tax break, monthly sales picked up in the final quarter of 2015 and the trend continued through the first months of this year. Sales of passenger cars climbed 6.7 percent in the first four months of 2016, according to a Bloomberg report. However, experts warn that short-term policies like tax cuts merely shift demand forward. Car shoppers are expected to buy this year and not next, leading to a downturn in 2017 after the policy expires. Consumers are less keen on buying premium cars because they may be implicated in the anti-corruption campaign. China is the world’s leading car producing country, with a production volume of 21 million passenger cars in 2015. The automobile industry has been an important driving force for China’s economy over the past decade. It contributes more than 10 percent of China’s gross domestic product, tax income, and employment. The economic slowdown since mid-2015 and the government’s anti-corruption campaign launched in 2013 have changed the attitude of Chinese consumers. To better understand the change in consumer behavior, McKinsey conducted a survey among over 3,500 Chinese in March 2016. One conclusion: Chinese car buyers are becoming more practical and less status-conscious than ever. Nearly half of the consumers surveyed see cars as necessities rather than as status symbols. Consumers are less keen on buying premium cars because they may be implicated in the Chinese leadership’s anti-corruption campaign. Upon taking office, Chinese regime leader Xi Jinping launched his political anti-corruption campaign, which targeted officials at all levels of the Communist Party and government bureaucracy for offenses including bribery and misuse of public funds. The report also found that online shopping for cars is an increasing trend in China and it is likely to accelerate as digital channels improve. Instead of buying a new car, consumers tend to choose a used car. Despite large discounts on new cars, almost half of the consumers surveyed considered a used vehicle when they last shopped for a car. Leasing, renting, e-hailing, and other car-sharing services are increasingly popular as well. These new trends will affect the new car market and create alternative businesses for automakers. Daimler, for example, has introduced a car-sharing service, Car2Share, in four major cities in China. Other automakers may choose to develop vehicle models specifically for e-hailing and other new mobility services. “For automakers, car dealers, and service providers, meeting these changing needs will be the key to success in a country populated by increasingly practical car owners,” stated McKinsey. China Uncensored: Did China Just Buy South Korea? South Korea has quite literally sold out to the Communist Party of China by canceling the Seoul performance of Shen Yun Performing Arts.